About A. Lewis & Co. 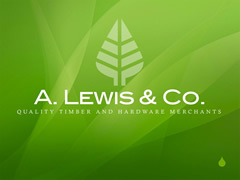 Established in 1905, A. Lewis & Co. was founded by Abe Lewis and continues to this day within the confides of the very same family through his third, fourth and fifth generation descendants. Putting over 100 years into our quality timber products, we have kept our position and incorporated hardware sales onto our premises to satisfy those DIY needs as well as the construction professionals. Every piece of high grade timber moulding produced through our state of the art and custom fabricated machinery is handled by at least one of the Lewis family; enforcing our attention to a quality product. We also care very much about our environment. Our aim is to be 100% Plantation Product suppliers by 2015. We are currently well on the way to this achievable target, we are proudly sitting at 75% currently. Also, through our membership of the Timber Merchants Association we are working on Chain of Custody (CoC) for all of our products. Many of our products have (CoC) already, as many of our suppliers are already strongly committed to this cause. All of our staff are trained to have a working knowledge of what timber and building products are suitable to each application and therefore are able to offer constructive advice to help our customers in the selection of a product suitable to their needs. In addition to this we have extensive stocks of our whole product range which have been stored correctly to ensure the product that leaves our premises are of the finest quality and in the best condition possible. Since our humble beginnings; our timber machining techniques have evolved to meet the needs and requirements of our customers with an emphasis on retaining the wood machining skills of old, combined with modern woodworking machinery and principles.